In a world where economic success stories have been few and far between in the last decade or so, fashion has beaten the odds. According to recent reports, the industry is set to grow substantially in 2018, paving the way for more choice for consumers, the emergence of new brands and more jobs in the sector. If you have an interest in fashion or you’re keen to land your dream job in the industry, it’s interesting to have a look at what’s in store for the world of fashion and how potential growth and diversification will impact recruitment. This guide will examine the state of fashion executive recruitment and provide a detailed insight into the landscape in 2018. It’s no secret that many industries have struggled to make a mark in the last decade. For years, the economy has been turbulent, and this has hit several sectors hard. While construction companies and manufacturers have reported losses, the fashion industry has emerged as a beacon of light and hope. The 2018 McKinsey & Company State of Fashion Report indicates that the industry is going from strength to strength on a global scale, with figures suggesting annual growth of around 3.5 to 4.5 percent in the coming year. The luxury market is particularly promising, with growth set to increase by 5 percent. Globally, the industry could boast a net worth of over $2,500 billion or approximately £2 billion. The UK’s fashion industry is estimated to be worth in the region of £28 billion (Source: British Fashion Council). Figures for 2018 are around 1 percent higher than those for 2017. Growing industries are beneficial for the economy, but they also provide benefits for the workforce. Fashion is one of the most successful creative industries in the UK, and more and more openings are becoming available as a result of the expansion of the fashion industry and its evolution. The industry is changing all the time, and just as trends on the catwalk evolve from one season to the next, consumer trends, together with technological advances, are bringing about modifications in fashion recruitment. It is estimated that more than half a million people work in fashion and retail in the UK. With growth forecast, this number is set to increase in coming years. What Do Consumers Want In 2018? Looking good is, and always will be, a priority for all consumers. However, the changing social mindset has influenced the fashion industry greatly – perhaps more than any other sector. The impacts have even seen significant brands like Gucci go fur-free while many others are having to find sustainable approaches to their garments in order to satisfy the growing desire for products that are free from animal cruelty. Sustainability is another key issue, which has resulted in a movement towards timeless fashion. Seasonal trends are still apparent but fashion items that can provide longevity, even if they require a little upcycling, have become increasingly popular on both sides of the Atlantic. While brands need to appreciate the changing face of consumer expectations, recruiters must also focus on building teams that are set to progress with the trends. After all, 2018 is unlikely to signal the end of those evolutions. Recruitment has changed beyond recognition in the last twenty years. Applying for a job today is a very different process. The rise of the Internet has almost certainly made an impact, but there’s also been a shift towards thinking outside of the box within the fashion industry. Companies use different ways of advertising posts and looking for new recruits, but there has also been a growing trend for hiring potentially surprising candidates among high profile operators in the fashion industry. 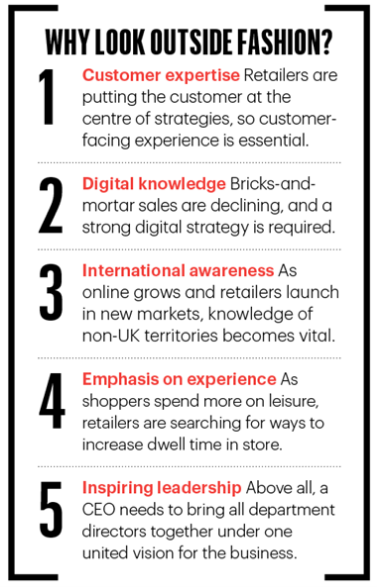 Appointments have caught the eye and hit the headlines, as leading retailers look for transferable skills rather than focusing solely on industry-specific experience. Take the example of Jill McDonald at Marks & Spencer, a former CEO at Halford’s who had no experience in fashion. Of course, recruiters are often enlisted to fulfil specific criteria, but perhaps appointments like this example show that fashion is integrating more closely into the world of business. Being creative is still very much an essential attribute, but there’s a wider pool of people who companies feel may bring something valuable to the table. The modern fashion industry is a different proposition, and to cater for this, recruiters may evaluate a broader spectrum of candidates. This doesn’t necessarily mean actively searching for people who don’t have a background in fashion, but it does perhaps indicate that an application from somebody who doesn’t have years of experience in the industry wouldn’t be throw out without a second glance. Recruiters value experience and a passion for the industry, but they also recognise the potential benefits of other skills and different types of career experience. Fashion isn’t just about producing beautiful pieces. It’s about fashion houses, designers, and retailers making money, providing secure jobs, and contributing to the overall economy. One of the most interesting aspects of fashion executive recruitment in 2018 is the diversity of posts available. Working in fashion can open you up to all kinds of opportunities in this day and age, so much so that you can have a completely different role to somebody working within the same industry now. Fashion has grown and expanded, and it welcomes a diverse range of candidates with varied skill sets. If you took a second to search for jobs in fashion, the sheer range of posts on offer may surprise you. There’s a veritable feast of opportunities way beyond designing, producing and selling clothes and accessories. From digital design to branding and merchandising, buying, product development, marketing, accounting, logistics and IT, this is an industry that relies on several cogs moving in the same direction. The nature of modern careers has also brought about a change in working styles. Although many recruiters still advertise full-time positions, which are office-based in a set location, it’s increasingly common to see opportunities that offer flexible working hours, the chance to be based at home and short-term contracts. People work in different ways now, and the breadth of positions on offer reflects societal trends. If you’re interested in fashion, and you’re looking for a job, you can tailor your search to suit your location, your qualifications and your level of expertise, as well as your preference in terms of whether you want a full-time, a part-time or a freelance job. For employers, it’s beneficial to be able to move with the times, but it’s also natural to want to keep hold of your best talent for as long as possible. With many people choosing to go freelance or set up on their own, it’s increasingly difficult to incentivise longevity in the industry. Within creative industries, more than a third of people are self-employed (source: Department of Digital, Culture, Media & Sport). As already touched upon, the marketing arena is one that has undergone an immense change in recent years, and social media has been a major player that the fashion industry has capitalised on more than most. In addition to revamped internal marketing methods, influencer marketing has become an increasingly integral element. The concept of consumers wanting to emulate the styles of their favourite celebrities, athletes, and musicians is nothing new but the digital playground has changed everything. Well-known faces will post pictures or short videos wearing a particular outfit or accessory in return for remuneration. However, this is only made possible due to the demand. 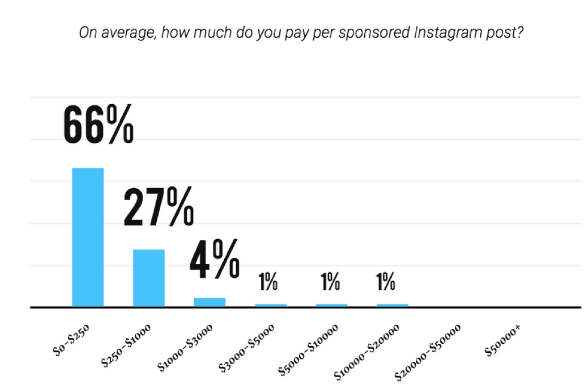 As fashion directors, recruiters, and marketers become increasingly aware of the fact that most people are more likely to notice an Instagram post than a TV advert, the trend becomes even more vital. In 2017, 78% of brands incorporated influencer marketing in some shape or form, up from 65% in 2016. As far as marketing is concerned, almost all recruiters should dedicate at least some of their budget to this growing phenomena. It’s no secret that despite the positive growth forecasts, the fashion industry faces challenges. You only have to pick up a newspaper or listen to the headlines to know that the high street is suffering as a result of changing consumer habits and competition from online retailers. Businesses face a different set of obstacles to those experienced five or ten years ago, and it’s more important than ever to find the best people for the job if you’re looking to expand your team or develop a new area of the company. Fashion is an alluring industry, and it’s not difficult to attract attention if you have a post available. The tricky task is finding the right candidate. Working with a recruitment firm that has experience within the fashion industry can help to match employers with the strongest swimmers in the pool. Recruiters know who works where at what level, and they have people in mind before openings even become available. An agent gets to know both the client and the candidate to ascertain if the position is right for both parties. By employing a recruitment firm, you save time and effort, streamlining the recruitment process to enable you to access those who tick all the boxes. Fashion executive recruitment must evolve in line with the development of the industry. Today, working in fashion doesn’t necessarily mean working in design or selling clothes. With the growth of online fashion businesses, there’s a demand for people who have technical skills, expertise in digital marketing and strategic thinkers who can give a high street store the best chances of riding the wave and retaining customers. Despite the rise of technology and the increased popularity of online shopping, many people still enjoy the experience of browsing racks and trying clothes on. If you’ve ever been into a store as a customer, you’ll know what a difference people can make to the experience. Customer service is a priority in the 21st century, and companies are looking for people who have the capability and the competence, but also those who fit with the ethos of the business. It’s not all about the numbers and grades. Recruiters understand the importance of personality, motivation, and passion, and they can help to root out those they believe have the potential to shine based on a specific client’s wish list. Once upon a time, a degree was the golden ticket to a career in a chosen field. However, as the growing desire for customer service skills shows, qualifications aren’t everything. Given the allure of working in the industry, combined with the more relaxed academic entry requirements, fashion courses are among the most popular for millennials. While that does mean the pool is bigger, recruiters should be prepared to go the extra mile to unearth the right candidates, especially as 41% of businesses agree that entry level positions are the toughest to fill. Likewise, graduates in fashion – or indeed any of the arts – should know that the competition for places is fiercer than ever. The arts rank 15th out of 16 subject areas regarding earnings while the number of graduates working in retail and bar work is significantly higher too. For recruiters, candidates with a little experience and a lot of ideas are essential. Judging graduates solely on their academic qualifications could spell disaster. If you’re passionate about fashion, you’ll know all about the benefits of spotting emerging trends and staying ahead of the curve. This doesn’t just relate to putting out an incredible collection that looks outstanding on the pages of a glossy magazine. It’s about understanding the challenges facing the fashion industry, taking steps to overcome them, and identifying ways you could potentially capitalise on them. To do this, it’s highly likely you’ll need a team of people around you. The way you recruit and the type of people you hire may make the difference between success and failure moving forward. If you read the news, or you’re au fait with industry statistics, you’ll know that online retailers, including Boohoo.com, have recently posted huge profits, while high street retailers, such as New Look and House of Fraser, are struggling to balance the books. 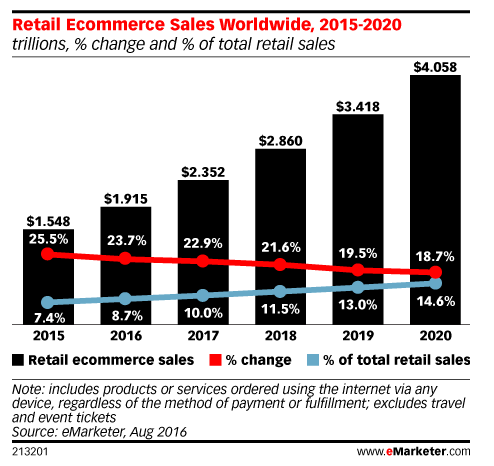 The move towards online shopping, which is highlighted in the image below, may indicate a problem for those who have put all their eggs in a proverbial physical store basket, but it could also pave the way for an upturn in sales for retailers that are willing to try and cash in on an emerging trend that is gathering pace at lightning speed. The changing landscape may require different skills and this is where a forward-thinking recruiter comes in handy. Yes, it’s important to have people who know the industry well on your team, but it’s also wise to look for the leading lights of tomorrow. If you can pre-empt problems and predict trends, you’ll go a long way to steering clear of trouble and driving sales. Brands face the challenge of beating the competition, but winning the war doesn’t necessarily boil down to offering better products. While the aesthetic and quality of the product are vital in the fashion industry, it’s unwise to underestimate the value of people, and the difference exceptional service can make. Even if your business is based online, user experience counts for everything. Whatever you sell and however you sell it, the people that represent the nuts and bolts of the operation can be as influential as those that drive the cogs. If you’re looking for a job in fashion or you’re a client hoping to attract incredible candidates to your company, hiring a recruiter with experience in fashion executive recruitment facilitates interaction between two parties that should fit together seamlessly. The fashion industry is booming, but it’s not all plain sailing for design houses and retailers. There are challenges, and for every business that is flying, there are those that are floundering. The key to success lies not only in producing and promoting quality products, but also in investing in the right people. To succeed in the fashion industry in the 21st century, businesses need to have a team that boasts diverse skills, and this is why fashion executive recruitment agencies are so valuable. Hiring the right candidates can make or a break a company in an age where it’s increasingly difficult to outshine the competition and retain a loyal client base. The world of fashion is changing, and there’s a much wider range of opportunities out there. Recruiters work to match clients with candidates that not only have the skills on paper, but also the creativity and the insight to move the business forward. There are many obstacles facing fashion houses, retailers and manufacturers, but if you employ the right team, there’s every chance of overcoming them and contributing to a bright future for this blossoming industry.